Smith has performed in North America, Mexico, Italy, Germany, Spain and England. Her solo CD, Lilac.Star.Bird, presents masterworks of the 20th and 21st centuries. 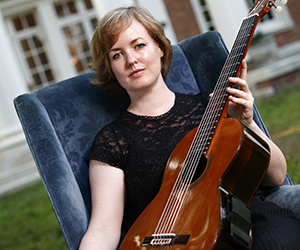 As a member of ChromaDuo with Canadian guitar visionary Rob MacDonald, she commissions, arranges, premieres and records new music. ChromaDuo’s debut CD features five world-premiere recordings; their second showcases their arrangements of works by Debussy and Ravel was released in 2016. Following degrees at Yale and University of Toronto, she completed a Doctorate at Peabody Conservatory under the guidance of Manuel Barrueco.